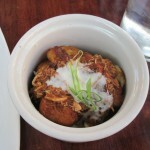 For dinner one evening, my friend Vanessa and I dropped by Beast to try their “Beast 120” menu. Most of the items are $4 each and are snack-sized. The 120 menu is available Wednesday to Saturday between 5pm and 7pm and require the purchase of a drink. Luckily the drinks were cheap too – between $4 and $5 for Ontario wine and beer. The restaurant is located in a very residential area on Tecumseh street (one block west of Bathurst), just off of King. Walking towards the restaurant, I thought I had the wrong address since I could only see houses down the street. Turns out, Beast appears to be in a converted house. Since they have a small patio, we opted to sit out there instead since the inside of the restaurant seemed really dark and depressing. 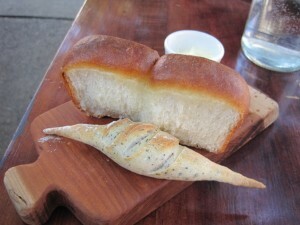 Since I knew they made their bread in-house, I ordered Rachelle’s Bread and Butter ($2). It came with two different types of bread (two of each type) – a sweeter, pull-apart bread and the other being a mini baguette which had a hard crust and a soft inside. Both were quite nice, but I preferred the sweeter bread. After being served the bread, we were brought the “Poutine” ($4). This was definitely a different take on the regular poutine consisting of cheese curds, gravy and fries. This “poutine” contained crisp, pan-fried gnocchi, braised rabbit and sheep’s milk cheese curds. 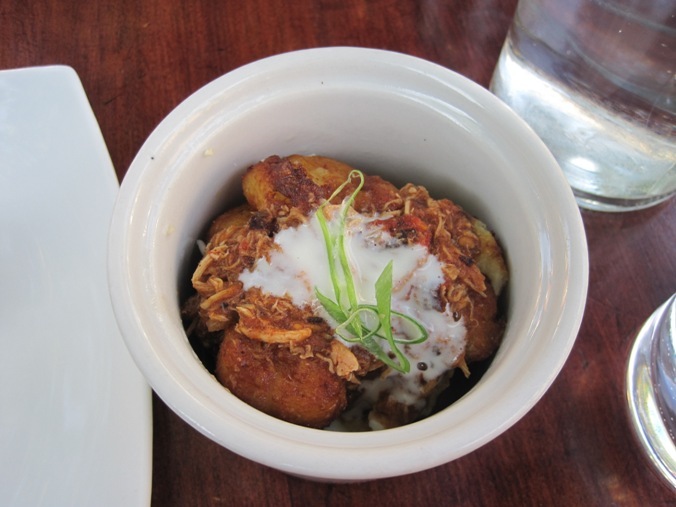 The gnocchi actually worked quite well as they had a crisp exterior, resembling fries and the pieces of rabbit were a nice flavourful addition to the dish. 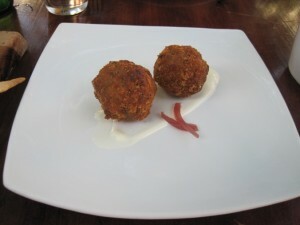 Next came the Dirty Rice Balls ($4), which consisted of two deep-fried Cajun rice balls. 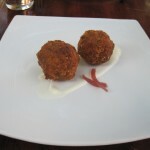 If you’ve ever had a deep-fried risotto ball, this was pretty much what these were like. 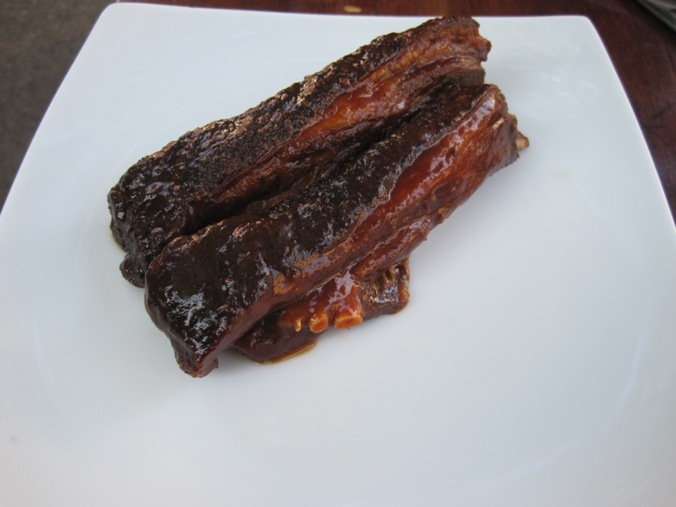 They were crunchy on the outside, with a soft interior. I wasn’t a huge fan of these as I found them to be a bit bland. We also ordered the Lamb Ribs ($4), which came with two ribs (as you can tell by now, the Beast 120 menu seems to cater to twosomes). 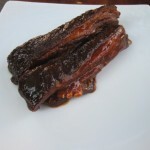 They had a crisp exterior and were smothered in a tangy Carolina-style barbeque sauce. The lamb was on the fatty side and had a bit of a gamey taste to it. Nevertheless, they were pretty tasty! Since I’m a big fan of lamb, I also ordered the Lamb Cevapcici ($4), which again, came with two pieces resembling nuggets. 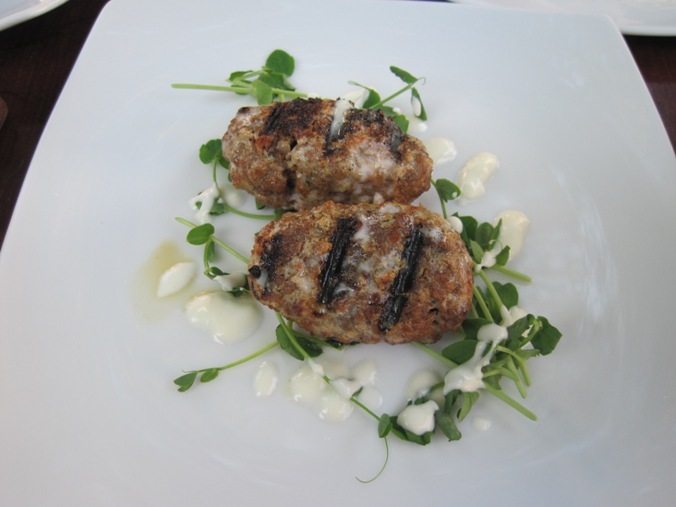 I inquired about what a cevapcici was and was told that they were basically lamb meatballs which are grilled. It was served with some sprigs of microgreens and a sauce, which looked like mayo. 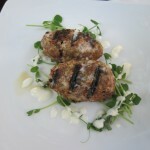 Since the meatballs on their own had a great flavour, I didn’t really try any of the sauce. I’d order these again. 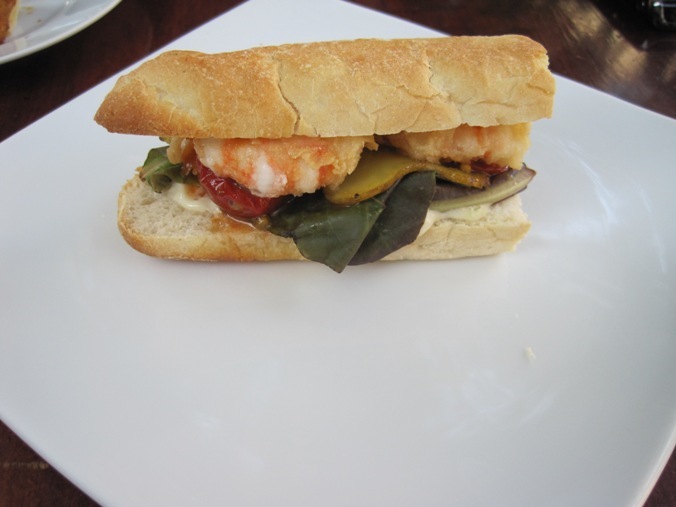 The last dish we tried was the Spot Prawn Po’Boy ($4). Po’boys are sandwiches which originated from the south and typically consist of some sort of deep-fried meat – in this case, deep-fried prawns. 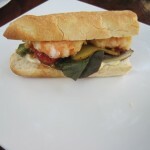 The sandwich was served on a mini baguette with two lightly breaded and deep-fried prawns. Don’t be fooled by the photo – it was a (two) bite sized sandwich. 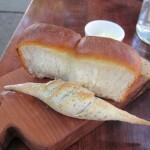 Anyways, I really liked the baguette it was served on, but other than that, it wasn’t anything special. They served the po’boy with a large piece of ginger in it which was unfortunate since I found the ginger taste to be incredibly overwhelming. But then again, I’m not a huge fan of ginger. I wouldn’t order this again. Overall, I think the Beast 120 menu is great value – cheap drinks and snacks. For what I paid, I thought it was pretty decent. However, prices aside, there were some definite hits and misses. I wouldn’t go out of my way to come here, but it’s worth a visit for the 120 menu if you’re in the area. Yeah, I saw your review on their brunch and should’ve just gone for that instead (maple bacon donut… drool)! The 120 menu… was not bad for the price, but I wouldn’t go out of my way for it.